babushka wrapped around her face. in the falling autumn foliage. the paper cups like vending machines on the go. some catching a snooze sitting like Buddhas. epic flames from the towers hit by the planes. Born in S. Korea, Therese Young Kim studied English and literature in Kyung Hee University in Seoul and worked at Lufthansa ticketing office before coming to America. 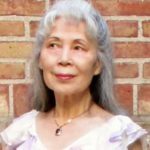 She worked as a professional interpreter for over 25 years in New York while immersing herself in poetry and prose in Korean and English, culminating in her literary fiction, Nayoung’s Journey, now seeking representation. Excerpts of Nayoung’s Journey have recently been published in Tuck Magazine. Her works have also appeared in Korean literary journals, as well as in Rosebud in two different issues and poems in Tuck Magazine and Poetry Pacific.